What a lovely looking Kidsaw childrens desk and chair. 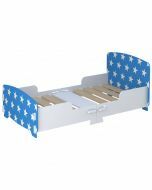 This item is cleverly design to just slot together, so no hassle with screws or glue, just simple. 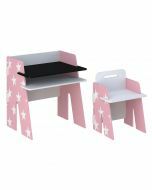 Comes with 2 shelves, one covered in blackboard paint and the other white with a grove for pens. 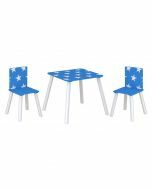 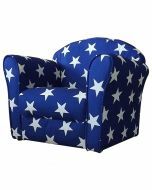 The desk & chair comes in a white and blue with white stars design giving this a contemporary/trendy/nordic feel. 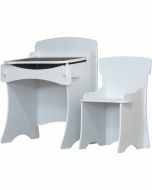 The set is made from MDF material.